Summer is just around the corner. And after the long, hard, seemingly endless winter, aren’t we all craving warm sun, longer days, and perhaps a little taste of the islands? 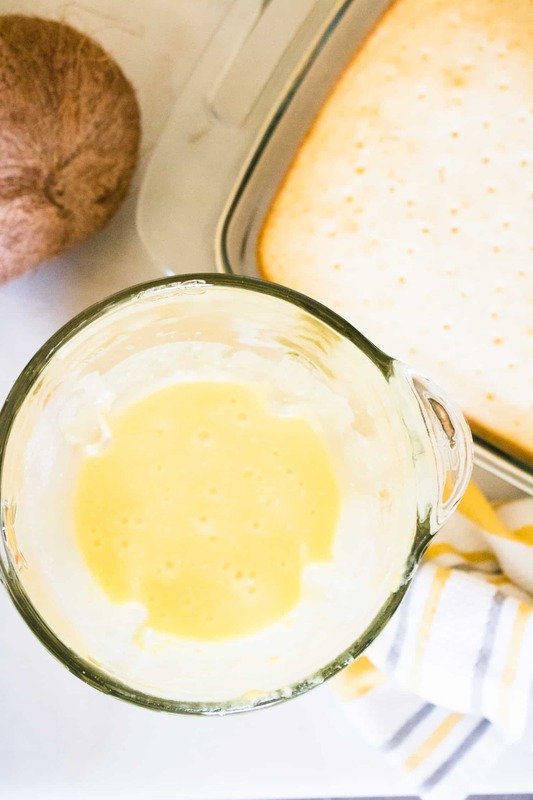 This simple and delectable Boozy Pineapple Piña Colada Poke Cake is just the recipe to kick off your summer. What’s more perfect for a summertime celebration than combining a moist and fruity cake with a classic tropical cocktail? Piña Colada, which means strained pineapple in Spanish, is a blended frozen drink made with pineapple juice, coconut cream and rum. It was invented in Puerto Rico during the 1950’s, and after achieving international fame, was declared the national drink of Puerto Rico in 1978. Synonymous with summer, the piña colada is a one of the most popular drink orders at vacation destinations and island resorts around the world. 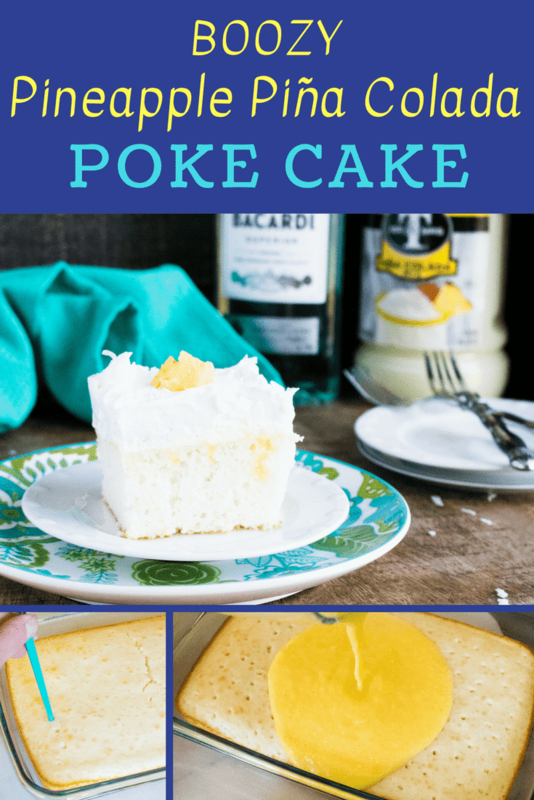 Poke cake makes for a super moist dessert! Poking holes in the cake allows the deliciously sweet and moist topping to seep down into the depths of the cake. Each bite has a touch of that glorious, melt-in-your-mouth pineapple piña colada filling. It looks fancy and complicated, but is actually quite easy to make. 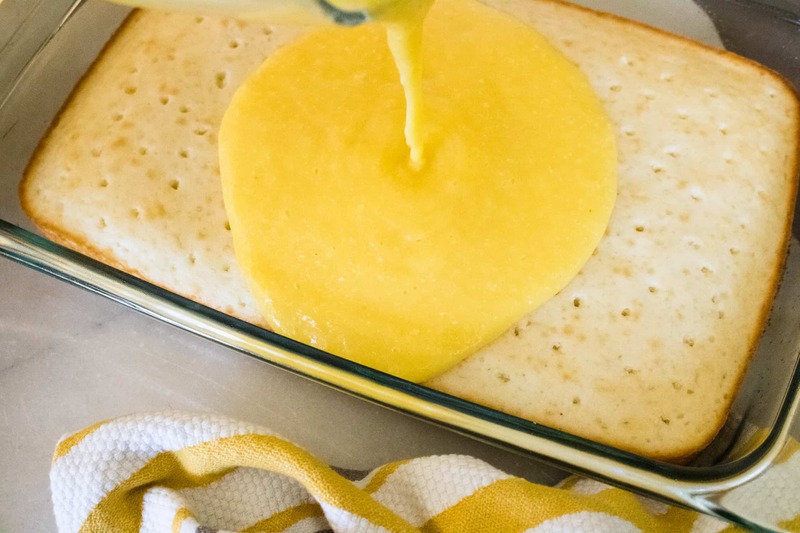 Using a boxed cake makes this recipe, well, a piece of cake! And poking the holes is simple and fun. Plus, the show-stealing filling is made of 3 ingredients that are quickly measured, mixed and spread over the cake. The whipped topping is quickly blended with 2 other ingredients and spreads oh-so-easily over the filling creating a simply beautiful dessert! It’s the perfect adults-only dessert to bring to a potluck, picnic or barbecue. 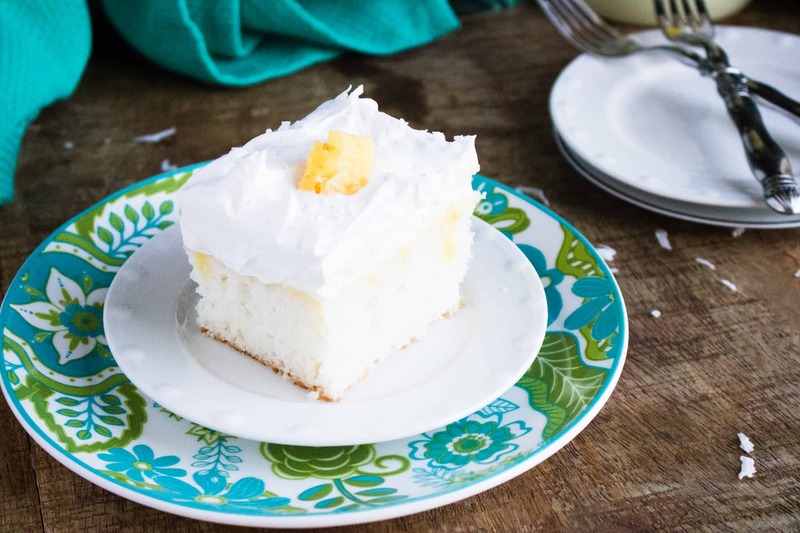 The taste of this Boozy Pineapple Piña Colada Poke Cake is so good and so full of tropical flavor that you can close your eyes and hear the ocean! Really! Try it! If you prefer a non-boozy poke cake, you can easily replace the alcohol with rum extract, using the ratio of 1/2-tablespoon of extract for 1 tablespoon of rum. 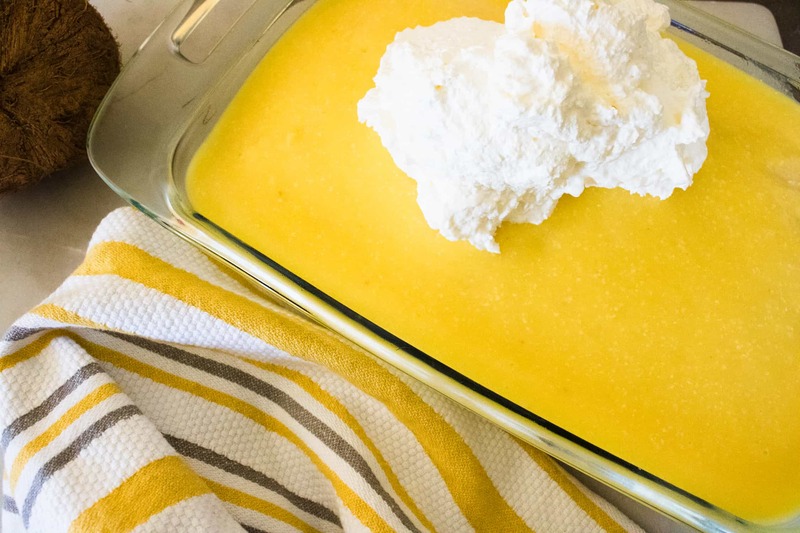 Or, you can check out our alcohol-free recipe for Pineapple Poke Cake for another booze-free way to enjoy the taste of the tropics. If you’re loving the poke cake concept, you’ve got to try this festive take on the popular Red Velvet Cake. It’s sure to be a hit at any celebration. Snickers Cheesecake Parfaits are a fun summertime treat that doesn’t require any baking. Perfect for those hot days when you’d rather not turn on the oven. To enjoy that classic taste fall anytime, try this quick and easy Pumpkin Dump Cake. Step #1: Bake cake according to package instructions. Allow to partially cool on a wire rack. Step #2: Poke holes with a fork or wooden skewer. Step #3: Combine pudding mix with 1 cup Piña Colada drink mix and 1/3 cup rum. Step #4: Pour over the cake and spread around to make sure it gets in the holes. Step #5: Mix together one container whipped topping with 1/4 cup Piña Colada mix and 2 tablespoons rum. Spread this over the top of the cake and then top with remaining whipped cream. Step #6: Refrigerate for at least an hour prior to serving. Step #7: Cut, serve and enjoy! 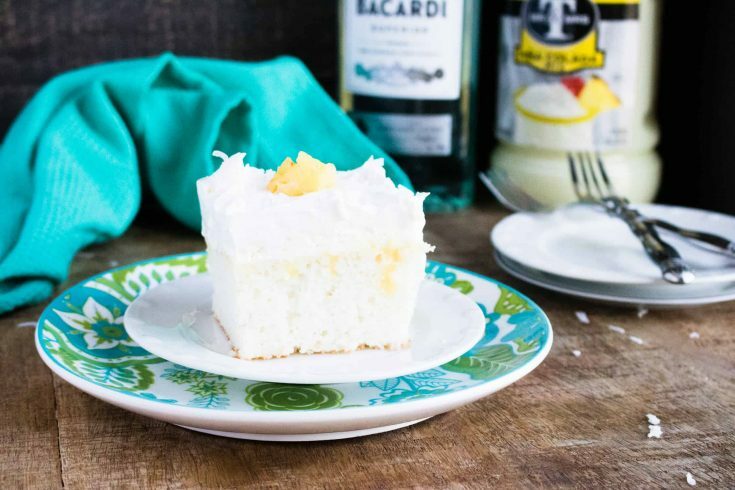 This moist and flavorful Boozy Pineapple Piña Colada Poke Cake is a little slice of summertime! Combine pudding mix with 1 cup Piña Colada drink mix and 1/3 cup rum. 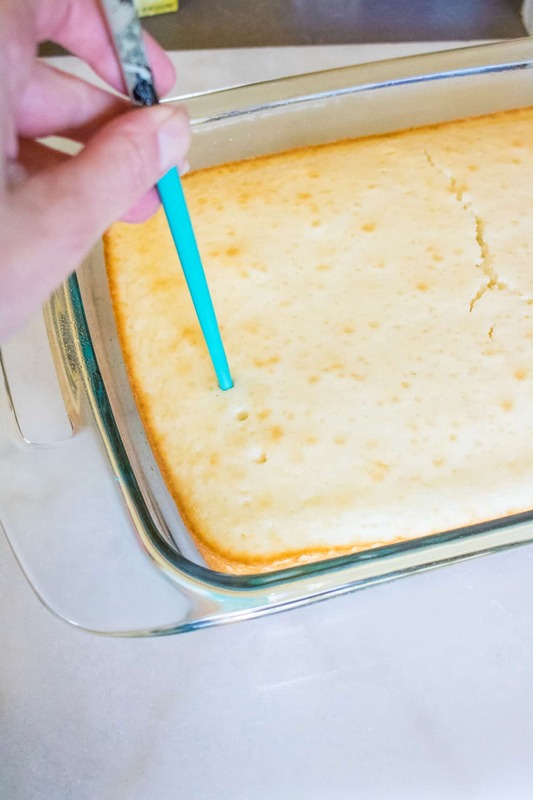 Pour over the cake and spread around to make sure it gets inside the holes. Mix together one container whipped topping with 1/4 cup Piña Colada mix and 2 tablespoons rum. Spread this over the top of the cake and then top with remaining whipped cream.